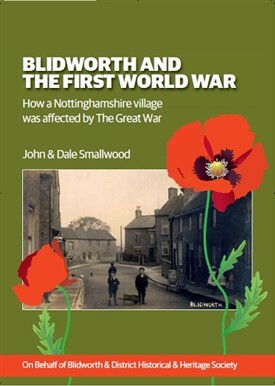 Blidworth and the First World War tells how life in the Parish of Blidworth, that at the time included Fishpool, Rainworth and Blidworth Bottoms, changed during the first 30 years of the 20th century. The book commemorates the local men who sacrificed their lives in the 'War to end all Wars' It also tells how the war might have been avoided if a shooting accident had ended in a fatality. We glimpse life as it was through the eyes of boot maker, Sam Clarke and hear stories about the daily life of our parishioners. We learn that Blidworth had the first Co-operative in the country. We introduce the reader to 'Plough Bullocking' and learn the rules of 'Husky Fusky'. We also tell of the revival of the unique 'Rocking Ceremony' in the St. Mary's Church of the Purification. The men who returned from the war faced great changes and some experienced severe hardships. The village became less dependent on agriculture as the as the mining industry developed and changed completely with the sinking of Blidworth Colliery. The book, which contains 132 pages is richly illustrated with photographs of Blidworth Parish and its people, many of which have not been previously published. Our book can be purchased directly from the authors at a cost of £10.00 or alternatively at £12.50 inc 1st class post and packaging. Please send your contact details by email to "dalesmallwood@ntlworld.com"
This page was added by Alan Higgins on 09/11/2014.